The Comfort Zero Wall (Wall Hugger) lift chairs can be placed just four inches from a wall. This lift chair glides forward to fully recline. The motion of the chair brings the ottoman (foot rest) up to your feet before it reclines, allowing you to sit with your feet elevated comfortably. 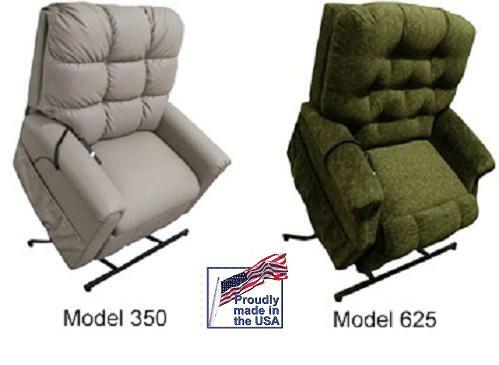 Comfort Chair Company lift chairs offer softer seats with high quality foam, well padded arms, engineered wood frames, superior fasteners, rolled-edge upholstery, premium stitching and removable backs. 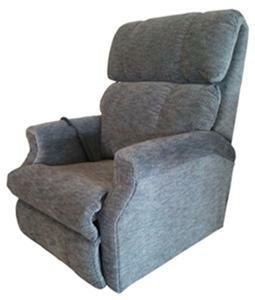 Solid Hardwood Frame: Comfort Chair Lift Chair uses a hardwood frame to provide long term strength. Double Comfort Foam: Comfort Chair Chair uses a layer of Ultra Cell Memory Foam plus a layer of Soft Topper Foam for outstanding comfort and reduction of seat pressure. Double Braced Back: Comfort Chair Lift Chair reinforces the back of each lift chair with double braces to provide users with stability and comfort for years to come. Six Patented No Sag Seat Springs: Comfort Chair Lift Chair protects users against a sagging seat by reinforcing the seat of the lift chair with up to six springs. Emergency Power Backup: Comfort Chair Lift Chair protects users against potential power outages by including a safe battery backup on every lift chair. Fabric and foam meet the UFAC and California 117 standards (fire retardant). Silent, low voltage motor for quiet operation. Displays traditional elegance and features button tufted styling. Heavy gauge steel springs provide maximum back support. Speciall patented "no sag" springs ensure long lasting support. Thick two layer Ultracel foam padding provides years of comfort. Available in standard, petite, wide and tall sizes. Available in 3 way model. Lifetime warranty on the lift mechanism. Lifetime warranty on the wood chair frame. 3 Year warranty on all electrical components.